Transitions are funny; changing from one state or condition to another in life sometimes happens without notice, but other times there is a definitive shift and you actually feel the difference before and after. “Transitions” is also an album by Westbound Train (local Boston band Jewels introduced me to a few years back). It includes so many gems that it has become one of my frequently played albums on iTunes. This last week has been one of the most emotional of my recent years, and while sitting on the couch Sunday afternoon decompressing, I realized it was filled with so many transitions that it was worth documenting my feelings. Monday and Tuesday - The beginning of the week was a blur of training my replacement. It was a delicate balance of being honest about the challenges she will face and being optimistic so as not to scare her. Leaving was something I had to do because well, it was time. Wednesday - Time for my farewell happy hour. I throw the best parties (not bragging, just factin’) and this was no exception. Back in 2009 when I quit to move to LA, I threw myself a fierce party and my BFF came to work with me for my last day. Thanks to her status in life at the moment (full-time nursing student doing her internship) she was able to come to happy hour. I can’t tell you how amazing it felt for so many people in my work family to meet my bestie! Given it was a mid-week happy hour and end of quarter, I planned for 10 people, max. The bar that hosted laughed when I made the reservation, but I was certain we wouldn’t exceed that many people at any given time. Boy was I wrong! We had nearly 50 people throughout the course of the night! I felt so loved and so special - I really didn’t know I was so popular! The night ended with several of us who came up the ranks of tech support reminiscing and FaceTiming with my missing work husband (and official PhotoShopper) Tyler. He and his wife are expecting their first child and we all paused to recognize the big transition they will be taking on as they add what will most certainly be the most beautiful baby, ever to their family. Thursday Morning - Jewels and I got breakfast and I set off to pack 13 years into 1 box (a joke with favorite work husband, it ended up being 2 boxes he had to schlep to my car but he didn’t seem to mind). As I made my round for goodbye hugs I found myself FAR more emotional than I expected. I have spent 38% of my life currently at this company surrounded by these people….they have been part of the fabric of my life for so long it’s hard to imagine not seeing them come Monday morning. I held it mostly together until after my last coffee date with my aforementioned fav. work husband. He wasn’t out of the car 3 seconds and I burst into tears. I don’t do well with change and the thoughts of not having all these familiarities is one I wasn’t processing well. Can I be *Sam without these people having my back? Alas, I didn’t have long to dwell on this because Thursday evening was the rehearsal dinner for Layne and Jay’s wedding (my other BFF and her fiancée). Suddenly all the work she and I had been doing to prepare for this wedding seemed very real. 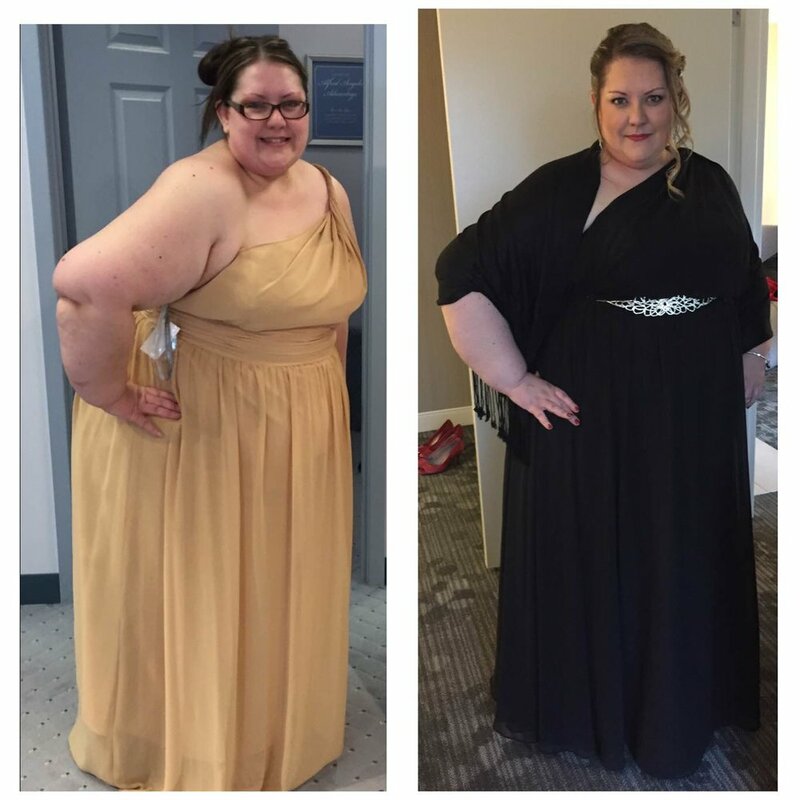 We both joined Studio Poise with the goal of looking amazing in our dresses; standing at the altar with her running through the motions I found myself crying again - yet another celebratory transition point! She was on the cusp of being a wife and we were both about to show off our fierce dresses and celebrate our accomplishments. I swear, I should really have been out of tears by Thursday. Haha. Friday Night - I sat down and digested all the sweet responses to my work farewell email. They were all so personal - a few detailing things I had long since forgotten that made an impression on someone’s life. One email really hit me and will stay with me for a very long time: “In addition to the place being less sparkly it will also be filled with a lot less love. No one will remember our kids names or ask about our spouses or celebrate our birthdays or send out 4,000 personalized Christmas cards. You were the heart of this company and you will be dearly missed.”. I worry sometimes that I don’t make an impact on the world around me (something the humanitarian in me longs to do). But, given the influx of very sweet notes it’s clear that I DO make an impact by showing up and making everyone around me feel special. Saturday - This was the wedding of the year and despite a few comical and not so comical SNAFUs we had the best day ever (one couple forgot all their clothes on the drive to Boston, it downpoured most of the day, the hotel wasn’t ready for us and ended up with a lobby of annoyed, overly caffeinated girls in the lobby). Layne and Jay have amassed a really special group of people in their shared lives and you could feel the love in the room. In addition to being the Unofficial Maid of Honor (we had all known Layne so long that she decided not to designate one, but my bossyness had earned me the UMOH monicker, lol) I was asked to give a speech about the new couple. I had practiced several times in front of people but right before I took the mic I was shaking like a leaf. Thankfully I owned it (with the help of my friend Andy who sang the songs I quoted from!) and as I toasted the newlyweds (with tears running down my face, obv) I realized we were hitting another transition. I was standing there in front of friends and family in a dress I worked SO hard to fit into (then ended up being too small for and needed to alter yet again, LOL) rocking public speaking (something I could NEVER do for years), truly happy with myself at that moment in time.